So, here's a simple thing to rustle up in the slow cooker. Can be beef or pork. Here I have pork roast. optional: vegies and potatoes, onions, etc. Throw pork in cooker. Give it a healthy pour of the alc. Mix up marinade and pour on roast. Add vegies if using. Do it in the mornin, come home ta dinna. Or at least eight hours. Got sauce meat. Yeah, sauce meat. Put meat in pan, spread out, and sprinkle garlic and cayenne pepper powder (if using fresh garlic and pepper, mince finely) and roll into meat as pan is heating up. Brown; not too warm so's to not over-cook it. Drain if necessary or desired. Reduce heat to about two/simmer and add sauce, oregano, pinch or two of black pepper, cinnamon if wanting a Med flavour, and olive oil. Stir and let sit/simmer for 15-30 minutes. Take off heat and eat - or let sit and cool, then eat or fridge it for later. A recipe for my wife's corn salad. Good stuff, and pretty healthy. Please note: All these ingredients are adjustable to your own taste. 1-2 tbsp. of Lime Juice (you can use lemon or a combination of both). Combine corn, beans, onion, tomatoes, and cheese in a bowl. I add the avocado to individual bowls, so if there is any leftover corn salad, the avocado won’t go bad (just chop some fresh avocado the next time you serve it). For the dressing, nuke the honey for about 10 seconds in the microwave to make it thin enough to stir in cilantro and lime juice. Pour dressing over corn salad and stir. You can serve right away, or let it sit in the fridge and serve it cold. Enjoy! Place each fillet on a sheet of tin foil. Add sliced lemon, red onion, capers and black pepper. Drizzle with oil wrap each to form a pocket. Bake for 10-12 minutes and serve with vegetables or a salad. Any time you are making something with refried beans such as 7 layer dip or quasidillas, mix some taco seasoning into the beans. Congratulations, you are a hero! Beat the whites and yolk and put in a skillet with cooking spray(I personally use canola cooking spray). Then, cook the eggs over a medium flame. Turn eggs over and add some cheddar cheese. Meanwhile heat up the tortillas in the mike or oven. Finally, Place eggs in the tortillas and roll up. you might want to add some salsa. Each fajita: calories 131, carbs 16 grms, protein 15 grms and fat 0.5 grms. And what's the real lesson? Don't leave things in the fridge. Found this recipe online and it has become my very favorite ever since! In a medium bowl, whisk together ketchup, sugar, Worcestershire, and vinegar; season with salt and pepper. Set aside 1 cup sauce for tossing raw chicken; use rest for baked chicken. Preheat oven to 450 degrees, with racks in upper and lower thirds; line two rimmed baking sheets with aluminium foil. Divide drumettes between baking sheets, and toss with reserved 1 cup sauce. Bake chicken until opaque throughout, 30 to 35 minutes, rotating sheets and tossing chicken halfway through. Toss baked drumettes with 1/2 cup sauce, and serve with remaining sauce on the side. I prefer using milk for the liquid in this recipe. It adds flavor to your dough. But if you don't have it, use water. dry yeast. Stir for 30 seconds with a wisk and set aside for 5 minutes. Allow to proof. or damp clean towel to cover it. Allow the dough to rise for 30 minutes to an hour. baking pan with yellow cornmeal or Farina. If you don't have these on hand you can use flour or simply grease the pan with olive oil. Bake for about 12­14 mins, but watch it! When the bottom looks slightly browned and the pizza looks bubbly, remove from oven. Combine everything but olive old, heat olive oil in skillet, cook. Place cayenne paste, water, vinegar and salt in blender. Blend on high for a minute. Place butter stick on a pan over a medium flame so that it melts. Add onion, garlic, tomato and the whole bottle of Louisiana Hot Sauce. Let all cook for about five minutes, stirring occasionally. Immediately pour into blender and add the pepper sauce. Blend on high for two minutes. Add the lemon juice, honey and ketchup, and blend again for a few seconds. Pour back into the pan where you melted the butter, and let it simmer for a good 20 minutes. Note: The cayenne pepper paste is something I get at Hy-Vee that comes in a tube like toothpaste. At my Hy-Vee it is located by the refrigerated fresh herbs section. You can play with this by using dried cayenne pepper which you boil down a bit instead if you cannot find it. Mix the seasoning all together in a big shaker bottle, then coat the wings in the mix liberally. Do not be afraid to go heavy as much of the seasoning will be lost throughout the process. Smoke the wings (my preference is Applewood chips). Cooking times will vary. My smoker is a gas one and runs hot so I will usually smoke them at just under 300 degrees for about an hour and 15 minutes. The key is to undercook them (basically weâ€™re parsmoking them) and then throwing them in a bowl in the fridge. When ready to serve (I make mine up the night before) grill on a hot grill about 6 or 7 minutes a side or so. Finish by tossing in the wing sauce or BBQ Sauce and serve. I'll have to save this. Everytime I think I want some homemade pizza, I scrap the idea because I think it will take too long for the dough to rise. Place a rack in lower third of oven and preheat to 525° or as high as oven will go. 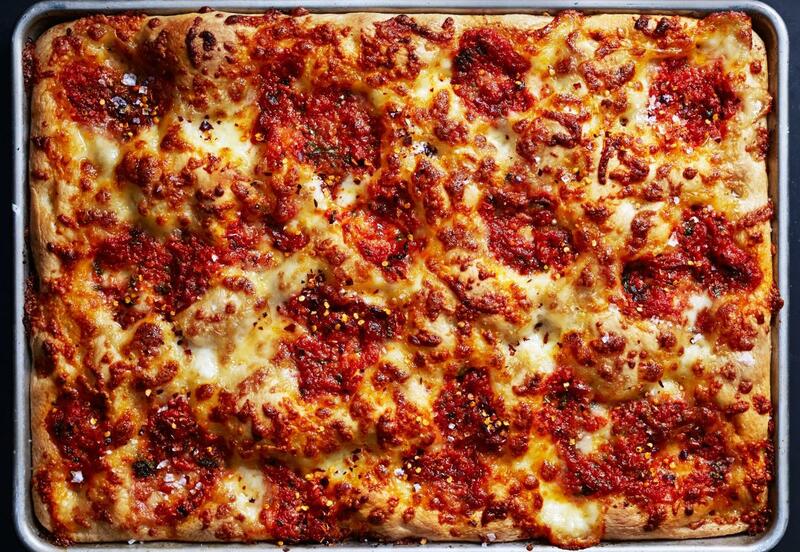 Once dough has risen on baking sheet, top with mozzarella, and dot pie with tomato sauce; sprinkle with salt and red pepper flakes, if desired. Bake pie until golden brown and crisp on bottom and sides, 20–30 minutes. I suggest getting a instance pot or some thing like it. I have a instance pot and a cossori. There mostly the same thing. Cossori is cheaper. We love them also rice cooker is very handy. Were cooking hot wings now. Lock steam . pressure cook on high 25 min. After timer chirps let out steam. These are not like old style pressure cookers. Pour wing sauce on drummettes . bake 10 to 15 min 350 degree. I tried a bamboo steamer and an electric rice steamer....eventually I read the package and found following the directions made great rice.